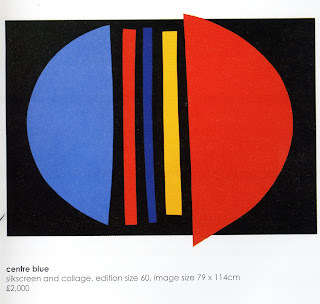 Along with Ellsworth Kelly, I admire the work of Terry Frost and in both find that their geometry and flat planes of colour hold their own language. I am still attempting to understand the meaning of 'abstraction'. "Abstract art is a non-mimetic art aiming at an aesthetic of objective invention and sensation, distinctly rational and determinist ... The work is the sum of what is in it and can be considered as the resolving of the situation where all variants of a formalised thematic grouped by criteria are ordered by principles of hierarchy". Terry Frost. Six Decades. Royal Academy of Arts. 2000. 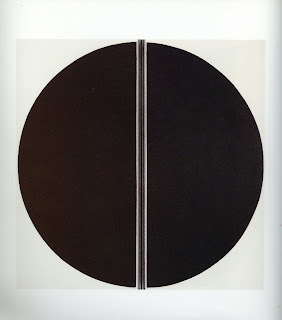 From Terry Frost. 'Black, white and red. Tate, st. Ives, narrated by Mel Gooding. 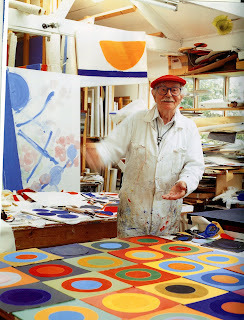 Terry Frost was a great thinker, philosopher and intellectual. His work has been hugely influenced by walks along the quay at Newlyn, watching the boats rock to and fro, creating arcs as the masts and sails move. For most of his life, his work showed arc shapes, half moons, parts of circles, triangles and spirals, chevrons, quadroons and rectangles. After some years of personal doubt and depression, he had found his forte. "....My mood has been one of deep depression and I'm still in a very shaky and queer state. It's partly due to my selling paintings regularly for twelve months, a thing I've never done before and it's very worrying. ...I can't see any point in just painting pictures for sale....I only hope I can get used to this professionalism, for if I don't, I'm a finished man and I might as well do some other job." p 85. How common is this? Many artists, including myself, hate parting with 'one off' pieces. They are so personal. Yet how will we live if we don't sell work. 'The value of a line, of a form, consists for us in the value of the life that it holds for us. It holds its beauty only through our own vital feeling, which, in some mysterious manner, we project into it'. Worringer. Black Circle. Like Ellsworth Kelly, Terry Frost makes a powerful and spiritual statement with a simple geometric shape, divided symmetrically. He uses a considerable amount of black and white in his work but is also a master colourist. 'Just to think in terms of colour is enough to set the soul alight. This is colour without shape - in the spirit. 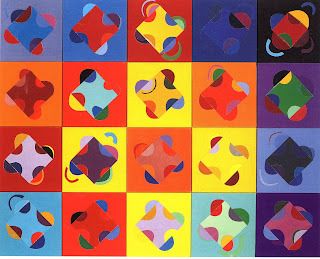 Shapes are known to people by words, but colour can make its own shape and exists in its own right.' From a text for students at Reading, in David Lewis, Terry Frost, Aldershot 1994 and 2000. 'The artist wants to be free but tremendous discipline is needed to use that freedom. There is no freedom without discipline. If there is discipline and no freedom, that equals no art, only propaganda. I rely a lot on what has gone before. I am influenced strongly by all the wondrous works I have seen. They convinced me by the subjective sensations I experienced in from of them that art is a real part of our lives. Some people react more than others and to different interests. But to see something that takes you out of yourself into a moment of a new reality, a sensation far removed from our normal reality and all its problems, is a tonic and spirit-builder. One looks, sees and feels a good form. Imagination works separately from reality. It belongs to us before reality. Reality isn't for long compared to imagination. Imagination thinks and suffers; it's primordial."